CABLE HIGHLIGHTS: Bravo’s SOUTHERN CHARM again led Thursday cable, up a tick to 0.59, with the series finale of GIRLFRIENDS’ GUIDE TO DIVORCE down 0.03 to 0.15. FX’s SNOWFALL held up well with a 0.48 season premiere, down a tenth from last year’s series debut, and up 0.09 from the Season 1 finale. On HGTV, FLIP OR FLOP gained 0.04 to 0.44, HOUSE HUNTERS ticked down to 0.29, and HOUSE HUNTERS INTL was down 0.02 to 0.27. 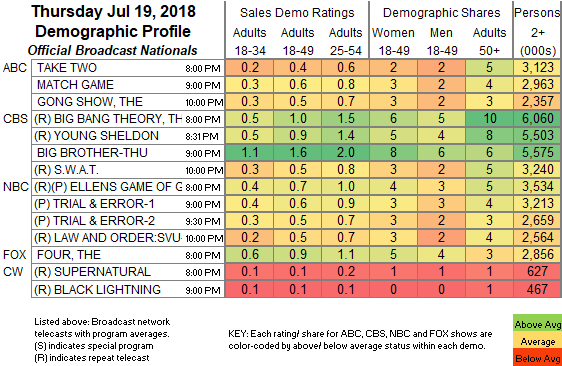 On USA, QUEEN OF THE SOUTH was steady at 0.40, and SHOOTER was down 0.02 to 0.19. ESPN’s MLB game was at 0.39. On History, MOUNTAIN MEN returned at 0.34, and ALONE was up 0.05 to 0.34. MSNBC’s RACHEL MADDOW SHOW led cable news at 0.31/0.47/3M, with Fox News’s TUCKER CARLSON TONIGHT at 0.25/0.44/2.6M, and CNN TONIGHT at 0.23/0.30/1M. 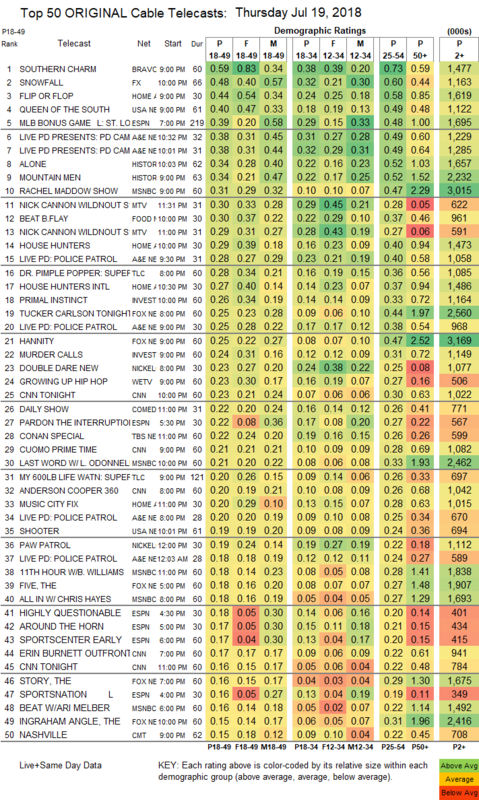 MTV’s WILD N OUT was at 0.30/0.29, identical to last week. Food Network’s BEAT BOBBY FLAY rose 0.05 to 0.30. TLC’s DR PIMPLE POPPER continued to exude elegance, down 0.04 to 0.28. On ID, PRIMAL INSTINCT dropped 0.06 to 0.26, and MURDER CALLS ticked down to 0.24. We’s GROWING UP HIP-HOP climbed 0.03 to 0.23. CMT’s NASHVILLE ticked up to 0.15. Tru’s THE CARBONARO EFFECT gained 0.02 to 0.15, and INSIDE CARBONARO held at 0.11. Freeform’s CLOAK & DAGGER lost 0.03 to 0.15. On Paramount, LIP SYNC BATTLE ticked down to 0.13, and AMERICAN WOMAN was up 0.02 to 0.12. Comedy Central’s DETROITERS ticked down to 0.12. POP’s IMPACT WRESTLING dropped 0.02 to 0.06.